Last fall we replaced the tile in our upstairs bathroom. My curtains were hemmed to reach the top of the tile as added insulation. The original tiles were 4″ x 4″ and only reached halfway to the window. The curtains hung low enough that they had acquired some water stains. The new tiles are 12″ x 12″ and they go all the way up to the window. I cut several inches off of the bottom of the curtains and hemmed them to stop just below the window. The water stained area was cut away and I have new curtains! What a difference! The curtains on my patio door have been cut apart and later sewn back together. When we bought the house, the patio door curtains were hanging in front of a picture window that filled only the top half of the wall. I cut them in half vertically and changed the hardware so they wouldn’t open to just one side. The patio curtain covered a third of that window. When I cut them in two it let in a lot more light. 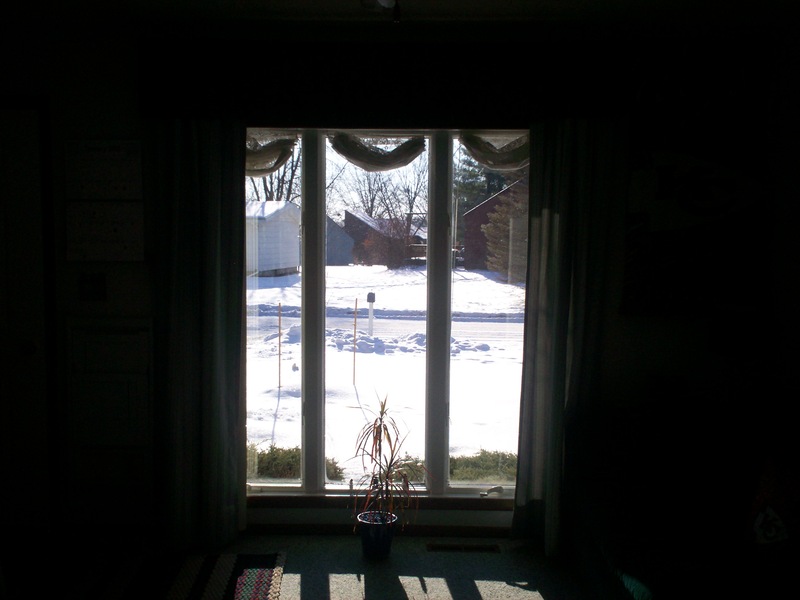 Later we replaced all of the windows in our home with Andersen windows. We put in a patio door in place of that window in the kitchen. I sewed the two curtains back together. As an added benefit, there is Velcro on both outside edges and when I shut the curtains at night I am sealing off the cold air from that north door. Finally in the front room…. 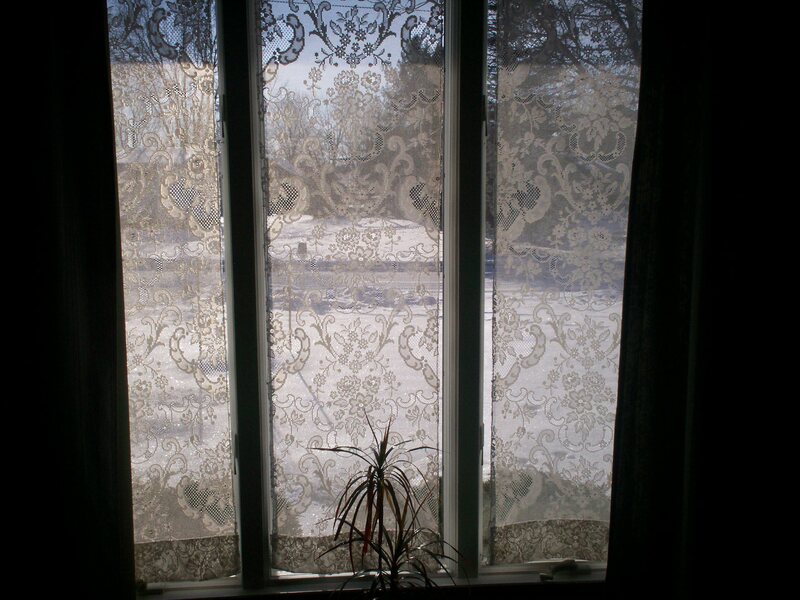 My favorite curtain project was with one large, lace panel. I cut it in thirds vertically and zigzagged the edges instead of hemming them. I hung them in my three panel picture window on cup hooks. (You could use tension rods.) From the street they look like designer curtains because the pattern matches perfectly. Later, I thought it would be nice to have Roman shades in that window. Instead of buying them, I wove string through the holes in the lace every three inches. When I pull the strings, it makes a pretty swag curtain. I love them! I have perfectly matched Roman shades from a large, lace panel that I purchased at a garage sale for a dollar! Your windows are your eyes to the world, but it is a cold, cold world and curtains let you shut it out! See how the pattern matches on the lace panels? I just pull the strings and I have lace swags! This entry was posted in Energy Efficiency, Make It, Use What You Have and tagged Energy Efficiency, Make It, Use What You Have by Frugal Fish. Bookmark the permalink.